I've been lucky enough to shoot at some very big sporting events over the years, including several London and Paris Marathons, the BMW PGA Championships, London Triathlons, and dozens of less well known but equally large events ranging from cycle races to MMA fights. Big events can be quite demanding to work on, but as with all the best challenges, they are often very exciting and ultimately rewarding. Here's some advice for those of you either hoping to shoot these events for pleasure or as part of a professional assignment. The start of the London and Paris Marathons — good luck trying to spot the people you've been assigned to shoot amongst that crowd! Will I need a media pass to take pictures or gain access to some sections of the course? If so, how do I go about getting one? In what area of the venue does the event take place, or what route does the course take? What lighting conditions can I expect? If it's an indoor venue, is flash permitted? If the event is outdoors, what is the weather expected to be like? How will I get around the venue or course? How much equipment should I carry? What will I need to get the shots I want? Are there any specific risks or issues with the event or venue I should be aware of? What are the best spots to get shots from? What's been photographed many times before? What's the "classic" shot, and what can I get that's different? Many of these can be answered via the event website, or they may even be common knowledge — the route of the London Marathon, for example, is pretty well known, along with spots that will yield the classic shot (runners crossing Tower Bridge). 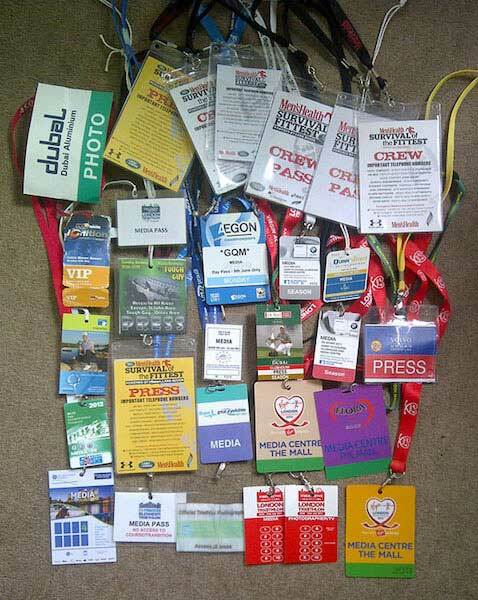 A small selection of the media passes I've acquired in the last few years. Media Passes: Get a media pass if you can, but don't expect it to provide access to all areas. If you're shooting on behalf of a client, they should usually sort this out for you, but you may be able to secure a pass in your own right — it never hurts to ask. The best people to contact are in the media department of the event, and you should be able to find their details on the website. A few years ago whilst shooting the Dubai Desert Classic for a UK Golf magazine, I headed out to follow Tiger Woods. I stopped at the first tee, and, although I had a media pass and a photographer's armband, I didn't have a "Tiger" pass, so I couldn't photograph him. No kidding. Always check these little details before you start! 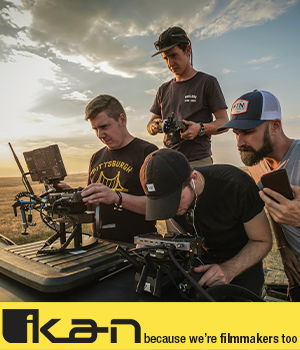 Equipment: As always, the key is to use the right tool for the job. You may need a 300mm or even longer to allow you to capture the action since you may not be able to get physically very close, but carrying such big heavy gear may limit your mobility at some events. Also bear in mind that many venues and events now ban "professional" equipment unless you're carrying a media pass, so beware of rocking up with your new 300mm f2.8 and just sitting in the stands. 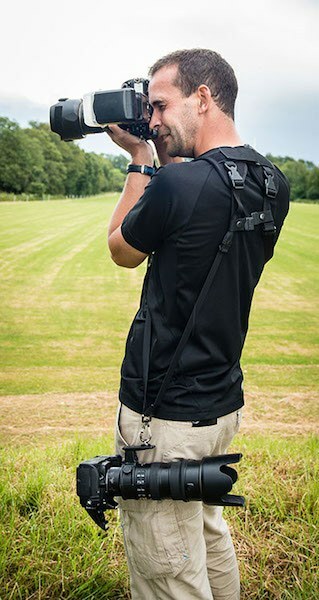 Personally, after getting a very sore back many times, I've opted to carry the minimum equipment necessary: usually 2 bodies, one with a 24-70 and one with a 70-200, along with all the required memory cards, batteries, and so on. I've also invested a lot of time, effort and money into finding a way to carry this stuff comfortably for long periods of times, and I've settled on a pair of Black Rapid straps, along with a pair of combat trousers with spare equipment stuffed into the cargo pockets. I also suggest carrying a few energy bars and water — you may be on the move for a long time without the chance to refuel! Me, with two cameras hanging off a pair of Black Rapids. It's still not as easy as getting someone else to carry them for you, but it's definitely the best solution I've ever found to preserve my back. Perils: It may seem silly to talk about physical risk, but if you're covering sports involving fast moving objects or people, which includes most of them, you should think carefully about the physical risks you expose yourself to. I've never been seriously injured on a shoot — although I've known people who have — but I've put myself in some very stupid situations. I've picked up countless bumps, scratches and bruises, as well as damaged my equipment in quite expensive ways. Racecars can come off the tracks, golf balls can go far wide of where they were aimed and bikes can miss corners, so make sure you're not in the way when any of this happens. Mind you, it makes for some cracking shots — just make sure you're around to appreciate them afterwards! Heino, the Berlin Polizei Colonel who rode me round the Berlin Velothon. It was extremely exciting to be riding pillion at 80mph with two camera bodies hanging off me, but it's not without elements of risk. Research: Spend a decent amount of time working out how you're going to get the shots you or your client wants. You may have very specific briefs — in my case, I'm often tasked with photographing specific people in a crowd of 30,000 plus — or you may be able to simply get interesting shots from the day. Either way, study the venue and the route very thoroughly, along with start times and other details of the day. As with any other subject, do your basic research if you don't already know the sport inside out. At the London Triathlon a couple of years ago, I was shooting at the exit to the swim, and one of the press photographers next to me turned and asked "Where are they going next?" 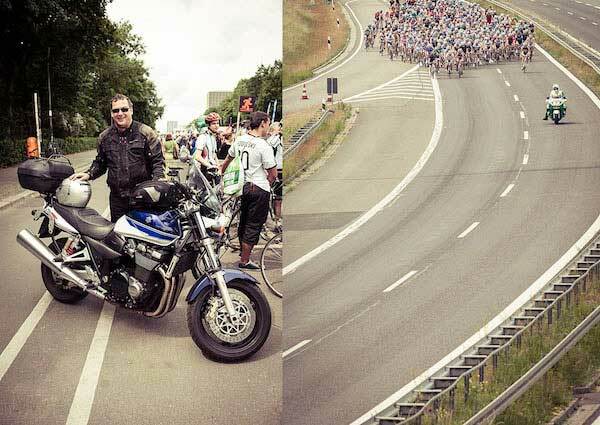 to which I replied, "Well, after this, they'll get on their bikes, and then they'll go for a run." It's called a Triathlon for a reason. Crowds: Don't forget that just because you've got a media pass around your neck and are covered in cameras, it means that people will automatically give way to you and let you do whatever you like. The crowds at big events can be huge, particularly at key spots, and you may be well served finding a position early to avoid getting shots of the back of people's heads! Also anticipate where the crowds will move throughout the day. 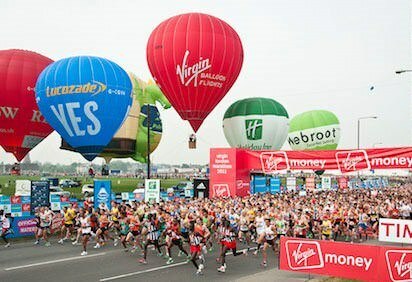 At most marathons for example, the finish area becomes very, very crowded roughly 3 hours after the start of the race and will stay that way until about 6-7 hours afterwards. If you need to get into an area like this, your pass alone won't be enough — you should scout a way in beforehand or go ahead of the crowds.